King 810 have gained themselves a controversial reputation for their lyricism notorious for undiluted angst of gun-talk and unapologetic violence, these themes depict the mercilessness of their hometown Flint, Michigan; morbidly dubbed ‘Murder Town’. 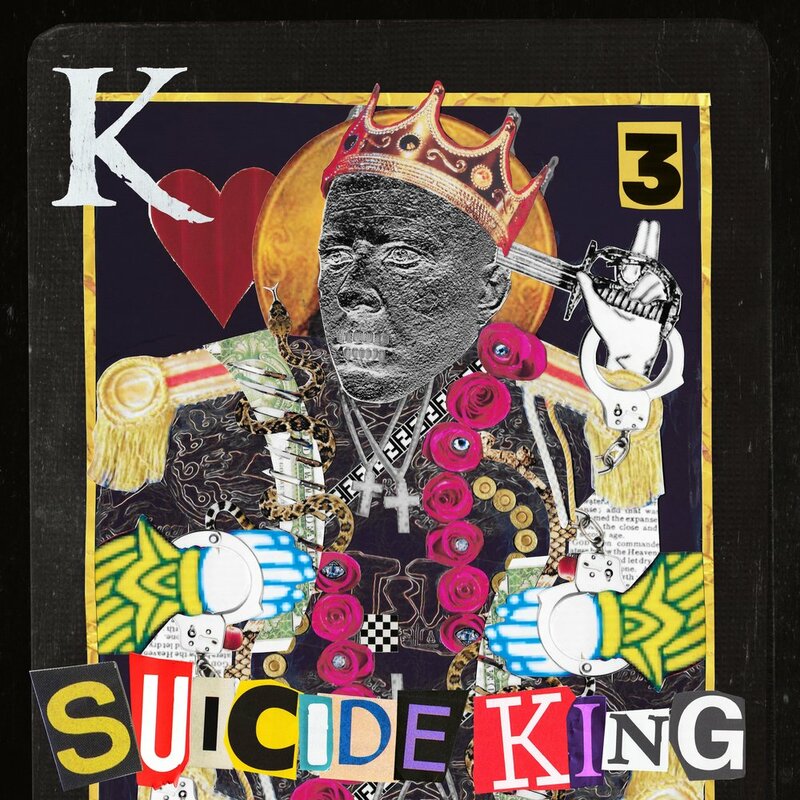 ‘Memoirs of a Murderer’ and ‘La Petite Mort or A Conversation With God’ followed basically the same formula and newest full length release ‘Suicide King’ is no exception. David Gunn is the ring leader of the King 810 operation, he spits venom laced lyrics describing the struggles between life and death, both abrasive and unrepentant – but when hailing from ‘Murder Town’ nothing is sugar coated. The track starts off with the bruiser ‘Heartbeats’; hypnotic chanting introducing the track presents an immediate sense of unease and then reappears later on in the track as a reaffirmation of King 810’s ominous and disturbing aura. Gunn’s eccentric vocals dramatically switches between rapping and gravelly spoken word throughout and have become his signature vocal delivery adds to the uniqueness that King 810 already possess. Distorted instrumentation and samples contort and twist around to fit in with the rapid vocals to give it its boisterous, commanding sound. ‘Bang Guns’ is a menacing anthem of the bands love of fire arms. Gunn’s growls out words that describe how the reality of life in ‘Murder Town’ has turned toy guns into real ones. ‘.45’ continues the narrative of gun-talk with the switch between spoken word and rapping with synthesised beats to push that vigorous, hip-hop style groove. Compared to other albums in King 810’s repertoire, this release gives off a more hip-hop influenced vibe which feels much more heavily digitised and refined, lacking the grittiness of real instruments which provided the traction that King 810 boast most notably in ‘Memoirs of a Murderer’. The latter of ‘Suicide King’, just like the formula of previous releases, is where the album peels away from the brutality and becomes experimental. Gunn’s crooning vocals accompanied by a delicate piano melody in ‘Black Rifle’. ‘Sing Me To Sleep’ with its industrial samples coupled with the robotic sounding vocals to conclude the album. ‘Suicide King’ demonstrates a totally different direction for King 810, David Gunn seeming to take the reins to push a more polished and hip-hop influenced sound.